As many of you know, Liam has Autism and is currently attending a PIC (partially integrated classroom) program at our local elementary school to help get him ready for school and continue with his therapies. Last year they spent a lot of time working on routines and classroom readiness and by the end of the year he had most of them down pat... so this year, after focusing extensively on his numbers and letters over the summer, he's working more on the skills he'll need for kindergarten. A few weeks ago I got a note home in his daily folder asking us to do more work at home with cutting and pre-writing and I started looking for ideas to do this in a way that was fun for him and I found this really cool set of workbooks put out by Mead called Mead Early Learning. There are four books in the set - two that Liam and I are working on now and two for future stages in his development. 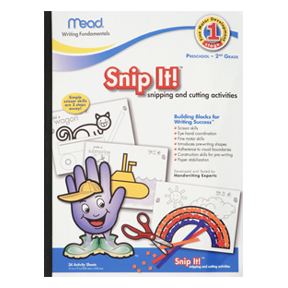 Snip-It!TM utilizes unique peel and stick pages allowing children to make colorful creations with their snippings. The National Parenting Publication Awards (NAPPA) named this product a Gold Award Winner in 2010. My review: This book has great activities that really have caught Liam's interest - we're working specifically on the snip it activities where we can peel away sections of the design and snip small squares to fill the gap... the rainbow is an illustration of this. As he gets more confident with coloring, he'll move on to cutting out shapes and gluing them on. This is a great book for anyone who wants to work on the fine motor skills required in cutting! Mead recommends it for pre-k to 2nd grade, and i concur. There are several other products in the Fine Motor Development stage including Connect with Color, Shape Builders Learn to Draw, Path Quest (perceptual motor adventures) and a Shape Builders Stencil Kit. 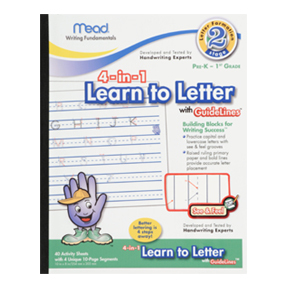 4-in-1 Learn to Letter writing tablet is divided into four sections: debossed capital letter guidelines, debossed lowercase letter guidelines, embossed raised ruling, and primary ruling paper. Learning Magazine named this item a Winner in the Teacher’s Choice for the Family category in 2007 when the item debuted. My review: The debossed pages are great! Even before Liam picked up a pencil, he was finger tracing the letters and feeling the indentations. With identifying arrow on each letter to remind him where to start, he is seeing immediate results. Once he actually writes a letter, he can see the letter looking like it should, since his freehand letters often go off on tangents (which is perfectly normal), but this allows him to focus more on the task at hand. He's working on upper case letters right now, and as he gets more used to writing, we will start on lower case letters and then use the raised rule and primary rule paper supplied to keep building his printing skills! There are three other products in the Letter Formation stage - CAPITAL letter Stories, lowercase Letter Stories and Number Stories - that you can check out! 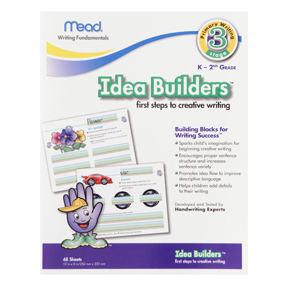 Idea BuildersTM is designed to spark a child’s imagination for beginning creative writing. It closes the gap between learning letters and writing sentences and paragraphs by teaching idea generation, use of descriptors and various sentence structures. My review: As with the previous books, this book has a stair step approach to building the skills it is designed to engage the youngster in wanting to expand his or her horizons. Liam is still working through steps one and two, but I really like the colorful pictures and visuals that Idea Builders offers. I'm looking forward to this one! wide-ruled notebook paper. Through the use of visual cues it helps learners recognize margins, control letter size and master letter and word spacing. 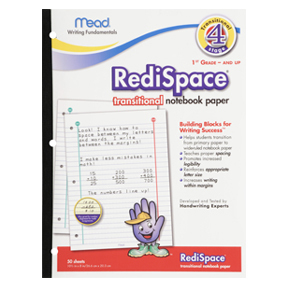 There are two other products in the Transitional Stage - Learn to write with raised ruling and RediSpace Transitional Storybook Paper. Overall, I think that this series would be a great boost for kids who need extra practice on fine motor and writing skills at home or for homeschooling parents to teach these skills! Are you intrigued? You can buy this series at Target or Mead Early Learning is offering one lucky Acting Balanced reader a chance to WIN the same bundle of products that I tested.
" I'm following @meadearlylearn thanks to Acting Balanced/ @chascouponmom and I want to #win the #giveaway on her blog http://bit.ly/fH9mhZ "
Prize pack from ActingBalanced/ @chascouponmom http://bit.ly/fH9mhZ #giveaway ends 12/22 "